Zendesk Chat vs. Intercom – Which One Should You Use? In the duel between Zendesk chat and Intercom, it seems that Zendesk chat rises slightly above Intercom. That doesn’t necessarily mean that Zendesk chat is right for your business. It is worthwhile to explore the features of both, prior to making a decision on which one you should use. It will also depend on the size of your business, how many features you’ll need to use, your budget, and how much support you need. 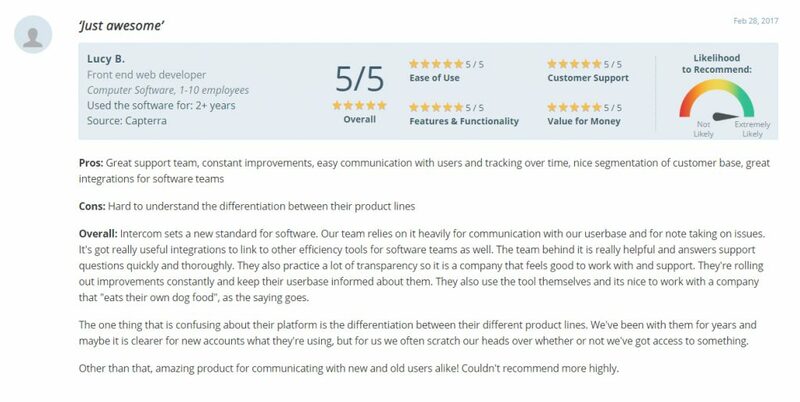 Intercom plays a very important role in the customer experience through messaging platforms, team collaboration products, and a valuable knowledge base solution. Intercom has recently received $125 million in funding, a number that tends to get everyone’s attention. It plans on using this funding to research machine learning technology instead of just lining their own pockets. This has many excited to see how the platform will improve. Zendesk is one of the top help desk CRM software providers. Zendesk has tons of products that are similar to Intercom’s including chatbot software, messaging, team collaboration, knowledge base, analytics and reporting. These products are able to integrate with each other, which offers customers more personalized customer experiences. Zendesk also offers tons of APIs to customize the software to the users’ needs. 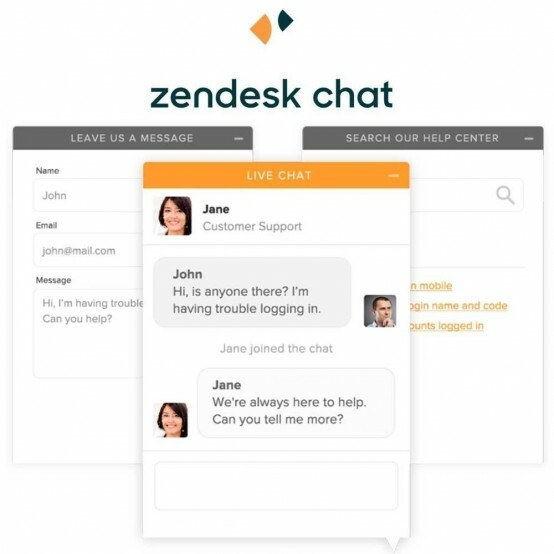 Zendesk chat allows businesses to reach out and connect to customers before they ask a question. The clothing rental company, Le Tote, uses an automated trigger feature to offer help when its customers are lingering at the checkout. This engages the customers during the buying process. The trigger feature reduces cart abandonment and increases conversions. There are key differences between Zendesk chat and Intercom. They do have a ton of similarities, but recognizing the differences may help you to make the crucial decision about which one to use for your business. One of these differences is the ability for agents to connect to customers through their own apps versus using a collaboration feature. Zendesk Chat and Message enable users to connect to their customers on a scalable app. This allows agents to work on their own device anytime and anywhere. Agents may manage multiple profiles from one dashboard. They can get the context of the customer’s questions and transfer questions from Chatbox into Message. The Zendesk platform also allows agents to switch between serving chats, phone calls, emails, or social media messages. Therefore, it is very versatile. Intercom, on the other hand, has a team collaboration feature. For support teams, ensuring that agents are on the same page is an essential part of the customer experience. When a customer works with two agents and receives two different answers, they’re going to be very frustrated and won’t value the experience. Therefore, Intercom may be a better fit for larger businesses with multiple agents helping people. Your selection of Zendesk Chat versus Intercom may depend on the size of your company. Both Zendesk Chat and Intercom have similar features, but Intercom is more suited for small to mid-sized companies. As your teams grow, you may want to look at Zendesk. For freelancers and enterprises, Zendesk is likely to be a better fit. Zendesk also has solutions for small to mid-sized companies as well. Online eCommerce stores may want to stick with Intercom. Intercom integrates with far more applications than Zendesk Chat. They integrate with Shopify, Mailchimp and Salesforce. Intercom can also integrate with Twitter and Facebook. This is helpful if you market your business on social media or provide support through Facebook. For online teams that collaborate using Slack, Intercom integrates with that as well. Intercom will also integrate with the Hubspot CRM. It should be noted that Intercom can integrate with Zendesk, so if there are Zendesk products that you like, aside from the chat feature, you can still use those. Both Zendesk Chat and Intercom will integrate with Salesforce Sales Cloud, Zendesk, and WordPress. Zendesk Chat will also integrate with Zoho CRM, which Intercom does not. Therefore, if you happen to have Zoho CRM and want to integrate your chat feature with it, you should go with Zendesk. Will your business need a lot of support? If so, you may want to invest in Intercom. Intercom features phone support, online support, and a knowledge base. Zendesk, on the other hand, only has online support and a knowledge base. Therefore, if you find that you are more comfortable seeking help from someone on the phone, you may want to chose Intercom. Zendesk allows you to talk to visitors online in real time. Zendesk Chat shows up as a chat bar docked at the bottom of your site. Visitors can click on the widget and chat with you. Zendesk chat provides a personal connection with customers who need support. It allows you to anticipate customers questions and offer help when and where they need it. Zendesk chat enables you to send targeted, behavior based messages to customers. It can help you to reach out to customers and help them complete purchases. Intercom gives you the ability to see who your customers are and what they do in your web and mobile apps in real time. It allows you to chat with visitors on your website and convert them into customers. Intercom assists with the onboarding and retention of customers through targeted email and in-app messages triggered by time or behavior. It enables you to get quality product feedback from the right customers at the right time through the app or by email. Both Zendesk Chat and Intercom have a free trial available and a freemium model to test out which chat service will work best for your company. They are both subscription based. Zendesk offers a very basic, bare-bones plan for one agent for $29 per month. From there, the packages go up to $89 per month. Intercom offers early stage startups plans starting at $49 per month. They have more extensive features and comprehensive packages go up to $202 per month. 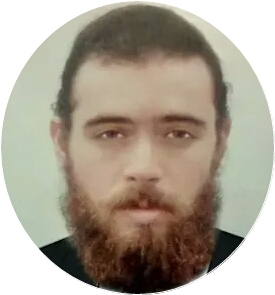 My personal recommendation is to use Zendesk. As a freelancer, I don’t need all the integrations and support that Intercom provides. Zendesk offers a basic plan that is affordable and will suit my needs. However, I do recommend Intercom for eCommerce stores that may need to integrate the features with their store.